"Life in the ancient world could be risky business. The perils of war, disease, famine and childbirth are a just a few examples of circumstances that contributed to a much lower average lifespan than that which we enjoy today. People in antiquity were no less concerned about the prevention and cure of maladies than they are now, however, and entire cults, sanctuaries and professions dedicated to health dotted the spiritual, physical and professional landscapes of the ancient world. The most important healing centers were the Asklepia, temple sanctuaries dedicated to the Greek god of medicine, Asklepios. Attracting patients from all over the ancient world, these medical centers also served as prestigious training academies for physicians. 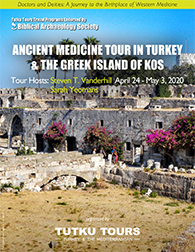 Two of the most famous Asklepia were in Pergamon, where the famous Roman physician Galen trained and worked, and on the Greek Island of Kos, the home of Hippocrates, traditional father of western medicine. science while surrounded by all the luxury and charm that the modern Aegean region has to offer." 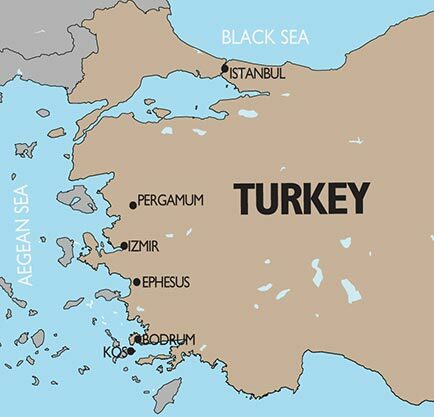 PERGAMON, IZMIR (SMYRNA), EPHESUS & BODRUM. • LEARN ABOUT ANCIENT HEALING TECHNIQUES AND TECHNOLOGIES. MODERN APPROACHES TO MEDICAL PRACTICES. This morning begins with a visit to the colorful Spice Bazaar before a leisurely boat tour along the European and Asian shores of the Bosphorus.